When Dr. Robert “Doc” Gukich was honored with a prestigious award recently, he said he was taken aback because he didn’t realize anyone had particularly noticed what he was doing at his veterinary practice. But people had indeed noticed. 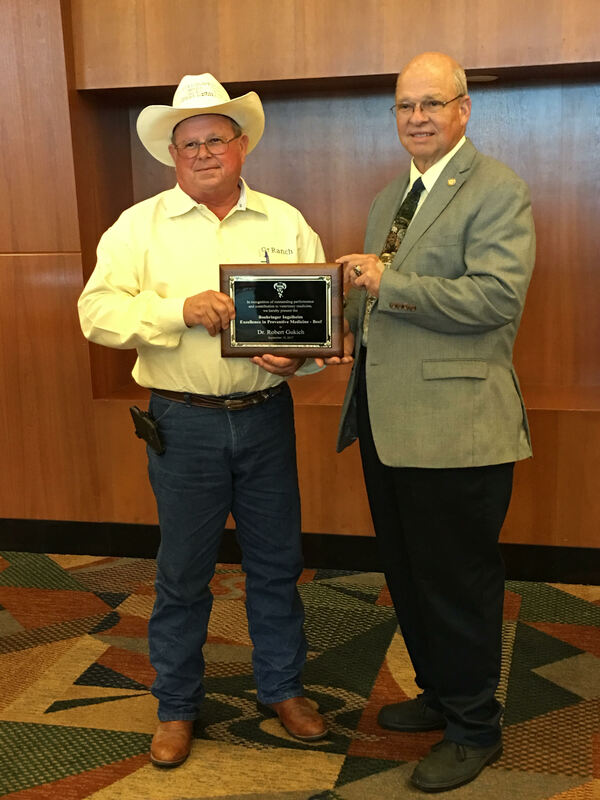 In recognition of his “outstanding performance and contribution to veterinary medicine,” the American Association of Bovine Practitioners (AABP) presented him with the award for Boehringer Ingelheim Excellence in Preventive Medicine/Beef. He says he was born, raised, and educated through high school in Polk County and has always enjoyed working with the FFA and Youth Fair animals free of charge. “It’s my way of giving back to something that meant a lot to me growing up,” he shares. He founded Lake Wales Large Animal Services, which specializes in bovine and equine species. The practice serves cattlemen who own more than 50,000 brood cows. The majority of his clients have been with him for more than 40 years. A founding member of Florida Cattle Ranchers (FCR), LLC, Gukich raises Fresh From Florida beef. In March, the first FCR beef that was born, raised, and fed in Florida was sold in local grocery stores. Gukich earned an associate’s degree from Alabama’s Marion Military Institute and a bachelor’s degree in animal science and DVM from Auburn’s College of Veterinary Medicine. Following graduation, he set up Lake Wales Veterinary Hospital. The practice expanded into a six-person, mixed-animal operation. After 25 years, Gukich sold his interest in the practice to focus on bovine and equine species as owner of Lake Wales Large Animal Services. He also built his own herd by leasing a local ranch and purchasing 500 head of cattle. Named for himself, his wife Doris and their five daughters, the G7 Ranch now has more than 1,300 head of cattle on 6,500 acres. It supports and contributes to the Florida cattle ranching industry. In addition, he oversees a 4,000-acre Ranch in South Florida that was purchased by his grandfather in 1947. It has been designated a Florida Panther Mitigation Bank by the U.S. Department of Fish and Wildlife. “The focus of his practice has always been preventive medicine,” says Dr. John Crews, associate professor of agricultural studies at Warner University and Gukich’s research partner. “Long before computer days, he meticulously wrote out detailed herd health plans for his clients.” He wanted to be sure they had the right information, and didn’t rely on clients hearing it all during exams. Gukich has traveled extensively throughout the U.S. to serve on drug advisory councils with nationally recognized pharmaceutical corporations. He has hosted numerous client educational meetings and has appeared on RFD channel’s “Cattlemen to Cattlemen” program as a featured guest to explain animal vaccines and vaccination protocol. He is a long-standing member of the AABP, the Society for Theriogenology, AAEP, AVMA, Florida Veterinary Medical Association, and the Academy of Veterinary Consultants.